Yesterday North Sea hosted the FINALS for the S4L TWELVE METER REGATTA, sponsored by SAIL4LIFE. Yesterday they raced a carefully thought out, no-frills Olympic course designed by Ldewell Hawker; Hawk also served as uber Race Director for the Finals event. Silber Sands and Joro Aya were the principal judges, ably assisted by Iteke and Rolf80 Titanium, and Taku Raymaker and Jane Fossett served as Appeal Judges. The remaining three teams were remarkably well matched. In the initial heats, WYC-1, WYC-2, and PENGZILLA had each earned a first place win. At that point the whole regatta was still a toss-up, anyone could win! It all came down to Race #4. Of course, things don’t really work out that way. 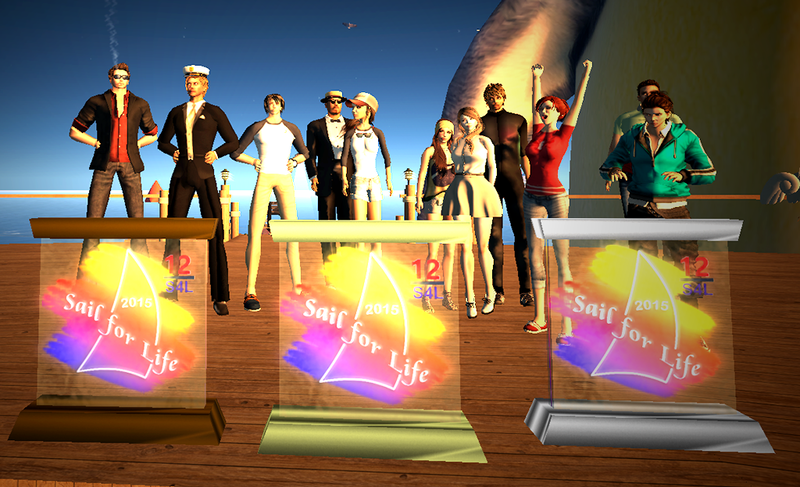 The whole idea of a regatta is to pick winners and losers and to shine a bright light on those sailors with stand-out skill and technical prowess that can bring them to victory against the best sailors in Second Life. In that Fourth critical race, each boat flashed evidence of unique sailing skill and champion style. My heart stopped a dozen times as I watched the fleet make hairpin turns around marks and execute tacks that forced boats within pixels of major collision. The Finish turned out to be extremely close, but as the salt spray cleared at the end of race #4, the judges were unanimous: Team Waypoint – 1 was the regatta champion (skippers: Bunnie Mills, nozomimi Karu). In an amazing demonstration of WYC’s ability, the Regatta Second-Place Award went to their sister WYC boat: Team Waypoint – 2 (skipper: io LittleBoots). You might ask: There were three boats! How close was that last race? How epic was the competition? Well kids, here’s ‘how’ 🙂 : Team Pengzilla (skipper: Chaos Mandelbrot) made a series of smart tactical moves during the race that allowed him to break ahead, and PENGZILLA actually crossed the Finish line in front of the Waypoint boats. Unfortunately (at least for you Penguin fans out there), it turned out Chaos made a serious, split-second error when timing one critical tack. The judges witnessed the event, and all agreed to DSQ the Mandelbrot-Boozehound Duck Dynasty Team from that heat. 🙂 This was an important decision that determined the outcome, so Jane, Taku, and Hawk all chimed-in too, agreeing 100% with the Judges’ decision. Chaos and Benny took their loss with typical grace, charm, and lots of laughter. They were happy with their performance, and were the very first to loudly congratulate the two incredible Waypoint winning teams!! As I said, I have much more to tell you about these wonderful races. Give me a couple days to edit the video, and then let’s talk about it!!! Awesome races — Thanks Jane. Congrats Waypoint and Florida Sails. Awesome races indeed! Non-stop thrill. Racing with teams more than doubles the fun… it’s something else! Thanks Jane, and looking forward to watching the video (and to more regattas!). and Thanks Jane for nice article. Awesome races come to my mind. I have many many pictures of you, all the way back to J-CLASSIC. When we do this event again, come race!